Wings´ XP Pilot embroidery software easily creates embroidery designs with Running, Satin, Zig-Zag, Step, Satin Serial, Zig-Zag Serial and Piping stitch types. You can also adjust the parameters of each stitch type to meet your embroidery preferences. Wings´ XP Pilot is the first level offering the ability to create your own pre-digitized fonts from True Type® Fonts and edit these to suit your needs. You can also edit the 49 pre-digitized fonts that are included with this level. Pilot can import 12 different graphic file types, including gif, tif, bmp, jpg, and psd. Toll Free Phone Support - Whether it's a quick question about how to perform a specific task, or detailed help with installing or registering the software, feel secure in knowing that you have unlimited technical support that's just a toll-free phone call away! Call 800-330-3867 (Option 2) Monday through Friday, 8:30 AM to 5:00 PM CDT (Central), excluding major holidays. Interactive online technical support is easy and hassle-free! This is live interactive support with a software technician, not a pre-recorded session. The software technician will connect to your computer over the internet and you can actually watch him work on your computer! Learn at your own pace with our online training available at the Mesa Training website. With our web-based training, you can access training any time on any device. 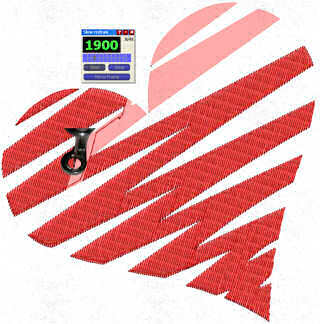 Slow Redraw lets you simulate the way the design will be embroidered by setting the speed of your machine, and can be used to calculate the length of time required to embroider the design. © 2019 MESA Supplies, Inc. All rights reserved.